While an arguably innovative design, the GT83VR Titan laptop is beset on all sides by options that offer a far stronger value. Seriously research what your five grand could net you before clicking the “buy” button. 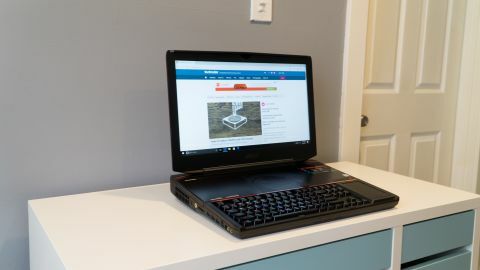 In the world of PC gaming hardware, we’ve come to accept gaming laptops as a fine path to get your game on, albeit a limited and expensive one. Firms have risen to challenge the limitations of the form factor for years, but MSI has gone to impressive extremes to make it happen. But, with the launch of its GT83VR Titan laptop, MSI’s methods are growing less impressive and more impractical. What you see here is one of the most expensive pieces of computing hardware we’ve ever witnessed that, despite all of the beefy parts inside an arguably innovative design, struggles to justify the premium. If you look at this monster and feel inclined to pick one up, then you better have good credit. MSI is selling two models of the GT83VR Titan. One comes packing dual Nvidia GeForce GTX 1070 chips in SLI for a cool $4,199 or £3,499 (about AU$5,503). But, should you want more power, then MSI is asking $5,099 or £4,499 (about AU$6,682) for a model housing two GTX 1080 graphics chips in SLI. All else between the two versions is identical, down to the top-end, quad-core Intel Core i7-7920HQ processor. MSI is selling the GT83VR through various online and physical retailers in the US and UK right now. We’ve yet to find models for sale in Australia, though it’s only a matter of time, with many in the region selling the previous version at dramatic price cuts. This is, without doubt, one of the most expensive laptops we’ve ever reviewed. At this price, we’d say the GT83VR leans too heavily on the power this setup affords, struggling to deliver the ultra-premium experience one would – and should – expect when dropping several thousands on a shiny new product. We’ll just come out and say it: this thing is ridiculous. The GT83VR is clearly an improvement upon MSI’s first go at the mega desktop replacement, the GT80 Titan of 2015, with more style, options and power than ever. But, at 13.13 pounds (5.95kg), the thing also weighs more than this editor’s damn dog, and isn’t any more practical than it was (not) two years ago. In fact, it's nearly 4 pounds heavier. Sure, the GT83VR looks slick with its bold red lines and brushed black, aluminum screen lid, but the base is still encased in simple, black plastic. We’d appreciate more premium materials when spending five grand. That said, the GT83VR makes liberal use of its gargantuan footprint. This laptop is absolutely loaded with ports, including the newest standards, like Thunderbolt 3 (USB-C) and a tray-loading Blu-ray burner drive. To that end, MSI’s latest is also still the most easily upgradeable gaming laptop in the scene. Thanks to its massive size, MSI was able to cram all of the device’s components up toward the device’s sturdy screen, placing them beneath a removable, aluminum faceplate. It’s from in here that you can access the storage, memory and optical drive for upgrades and maintenance. So, where does that leave the keyboard and mouse? With the added space, MSI was able to include the same mechanical keyboard and digital number pad-meets-touchpad beside it as it has in previous versions. Though, now it features Cherry MX’s speedy switches found in Corsair’s latest K95 RGB Platinum keyboard and a fully-customizable per-key RGB setup. While a mechanical keyboard on a gaming laptop is impressive, we have two issues with this setup. First, because of how raised the keyboard is due to the laptop’s base height, coupled with the fact that this laptop has no palm rest, typing on this keyboard is deeply uncomfortable. It might be improved with some sort of wrist rest, but the last thing someone wants to hear when they’ve just spent five grand is that they need to spend more. Second, the touchpad beside it that can turn into a numpad with the touch of a digital button takes a few more touches than it should to activate. We still haven’t figured out the proper way to tap the button – it seems to function when it pleases. That brings us to an important question: if you have a spare five grand to make it rain on your PC gaming hobby, is this where you should be spending it?